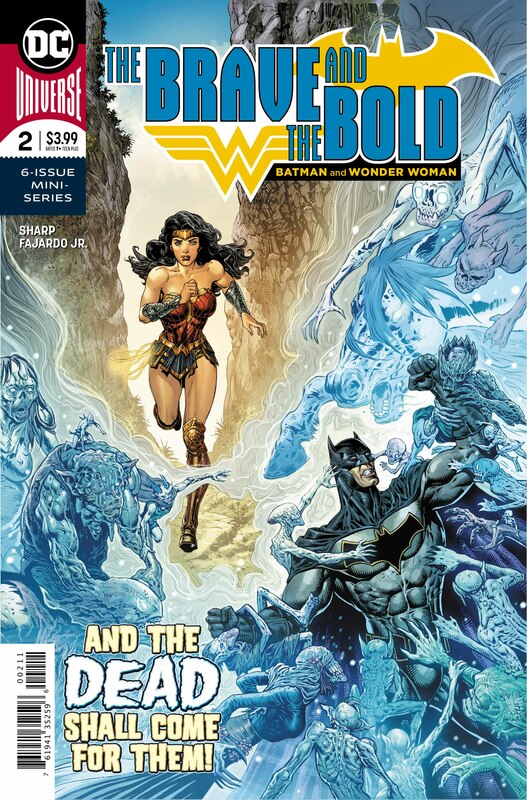 The Brave and The Bold: Batman and Wonder Woman #2 Review – AiPT! An improvement over the first issue, despite its problems. Liam Sharp’s Celtic-infused story got off to a poor start thanks to last month’s The Brave and the Bold: Batman and Wonder Woman #1. Fortunately, the second issue of the six part mini-series fares a bit better. The Brave and the Bold: Batman and Wonder Woman #2 deepens the mystery laid within the first issue and isn’t bogged down by overbearing explanations of Celtic lore; however, it still suffers from an almost snail like plot pace and questionable characterization of Wonder Woman. The first issue was so wrought with exposition that this second installment feels like a proper introduction that truly sets the stakes for this series. In hindsight, the first now seems more akin to a boring but necessary preamble to the story. In #2, readers witness firsthand the fragile peace the factions of Tir Na Nog share and just how close they are to civil war — a war that can spill into the realm of man if left unchecked. That sets a level of importance for Wonder Woman’s investigation into the mysterious death of King Elatha — an importance not made clear before. It is revealed that neither side has any reason to kill the beloved King and both seem to acknowledge this murder could open a rift between the two that sends them spiraling to war. Combine this with the nightmarish Celtic hallucinations in Gotham seemingly caused by a gateway to Tir Na Nog being opened and suddenly there was a mystery to this series that felt worthy of investigating. The mystery may be more fleshed out by the end of this 23 page story, however, there is still very little provided to the reader to surmise what is actually going on. It’s clear Sharp is after a slow burn style of storytelling, which I assume will all come together in rapid succession in the fifth issue, but after such a slow start to the series I was really hoping for more concrete details or story progression in this issue. So far, wonder Woman has been at the forefront of The Brave and the Bold, but Sharp takes her in a surprisingly helpless direction in this issue. Wonder Woman has never been more popular, a beacon of femininity that empowers women of all ages, but rather than build on that Sharp’s Wonder Woman is rendered ineffective in investigating the murder of King Elatha. She attempts to beat answers out of a De Denann captain, but is unable to intimidate the troll. She tries using the lasso of truth to wring the truth out of a Fomorian commoner, but in a land of endless magical tricks her lasso comes off as nothing more than another gimmick. She eventually resorts to pulling Batman into the faeryland to crack the case, as if she were some damsel in distress who can only be saved by the Dark Knight. Wonder Woman just comes off as completely useless in this investigation, nothing more than a vehicle used to bring Batman, the real detective, into the story to save the day. There’s still plenty of time for Wonder Woman to shine and be the badass she really is, but, as of this issue, Sharp is doing Diana and her fans a disservice. One thing that has become abundantly clear in the first two issues of The Brave and the Bold: Liam Sharp can DRAW. Everything is gorgeously rendered with tremendous detail. From the grimy alleys of Gotham to the grotesque features of De Danann trolls, both characters and environments are brought to life thanks to exquisitely intricate and detailed pencils from writer-artist Liam Sharp. I particularly enjoy Sharp’s depiction of Batman, foregoing the stockier, beefy Dark Knight for a more classic slender and toned Bruce Wayne. On top of the art, the lettering from Troy Peteri adds depth to the story in a way that is noticeable but not distracting. The placement of dialogue bubbles help each conversation flow gracefully and the wavy lines around the De Danann troll’s speeches along with the more calligraphic lettering from the Fomorian people give each character a distinct voice. I couldn’t help but read the trolls in a gravely voice while imagining a thick Irish accent for the Famorian characters. Despite its problems, The Brave and the Bold #2 is an improvement on the introductory issue. The stakes are more clearly defined and the mystery is given a depth that will entice investigation, all presented in beautiful fashion thanks to Liam Sharp’s art. However, there’s still plenty of room for improvement with this series, particularly in Wonder Woman’s arc and the snail-like pacing of the narrative. #2 is good enough to make me want to read #3, but #3 needs to do something drastic to hold my interest any longer. The Brave and the Bold: Batman and Wonder Woman #2 deepens the underlying mystery and more clearly defines what is at stake, but still suffers from really slow pacing and poor use of Wonder Woman. Liam Sharp is one helluva artist, with intricately detailed environments and character models. The grand mystery at the heart of the narrative and its stakes deepen more interestingly than it did in the first issue. Despite a clearer explanation of what's at stake, the narrative still moves very slowly, with little given to the reader to help them surmise what is going on. Wonder Woman feels frustratingly useless in this story; just a vehicle to get Bruce Wayne into Tir Na Nog.